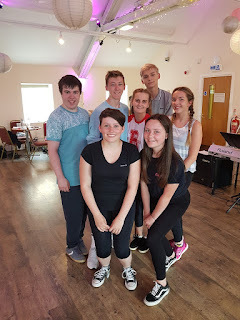 The cast of this year’s Summer School at The Customs House are in rehearsals for their forthcoming production of musical comedy The Addams Family. Last year’s Summer School production of Legally Blonde was named Best Amateur Musical in the North East Theatre Guide Best of 2017. Auditions for the roles of Gomez and Morticia Addams, their children, Wednesday and Pugsley, close family members Uncle Fester, Grandmama and Cousin Itt and the family’s butler, Lurch, were held in April. Children and young people aged between eight and 21 were invited to take part and a 35-strong cast has been assembled, with the Summer School taking place during the first three weeks of the school summer holidays. It concludes with five performances over three days, from Friday 10th to Sunday 12th August. The Addams Family cast members (back row, left to right) Robert Wilson Baker, Corey Adam Muizelaar, Katie Reed and Kai Newton (front row, left to right) Holly Chinneck and Emily Mohan. Corey Adam Muizelaar has been cast as Gomez, while Katie Reed will play Morticia, and Emily Mohan and Melissa Whale-Spencer their children, Wednesday and Pugsley. Uncle Fester will be played by Robert Wilson Baker, Grandmama by Holly Chinneck and Lurch by Kai Newton and the disembodied hand, Thing, will also make an appearance. The Addams Family started as a cartoon series in The New Yorker and the macabre family has since been depicted on TV, in both live action and animated form, in film and most recently, on Broadway and in the West End. Featuring an original story, the stage version sees Gomez do something he’s never done before – keep a secret from his wife when his daughter confides in him that she has fallen for a ‘normal’ boy. So what happens when they invite his family over for dinner? The ‘normal’ family will be played by Katie Stubbs (Mal), Nieve Murphy (Alice) and James Jobling (Lucas). Tickets for The Addams Family are priced from £10 and are available from the box office on (0191) 454 1234 or online at www.customshouse.co.uk.